WordPress, a popular CMS platform that is widely-used across the globe, allows you to easily create, edit, and manage content on your site as well as change how it looks and function. WordPress can be installed on just about any type of hosting, so the plans below offer managed WordPress hosting. With managed hosting, the provider handles several routine and precautionary tasks, like setting up security and backups, installing plugins, running updates for themes and plugins, and keeping WordPress up to date and optimal. Many of the reasons WordPress has gone on to be the most popular CMS platform in the world are tied to its ease of use – people entirely new to WordPress can pick it up and get started blogging in just a few short hours. If you’re willing to put in the time, you can do most things covered in managed WordPress hosting yourself. Additionally, for smaller sites or less competitive fields, managed hosting doesn’t have quite the impact it could otherwise. However, if your business operates on a larger website or you are in a highly-competitive industry, a 10% boost to performance can give you an edge to over your competition. Managed hosting can cut the costs associated with your own IT or web development team while still allowing you to reap many of the benefits. WordPress is an open source platform, and wordpress.com is the hosted version of that software. WordPress.com is co-run by the company Automattic, and it allows you to build and run your site for free. Hosting your site with WordPress.com is similar to managed WordPress hosting in that the back-end features of a website and configurations are taken care by the host. Domain names will end in “.wordpress.com” – For example, if this site used the free wordpress.com as its host, the domain name would be whdb.wordpress.com. No uploaded plugins of any kind (free or paid) – Plugins allow you to make the most out of WordPress as a CMS and can enhance your site’s overall performance. No Google Analytics or Ads – You also can’t advertise and monitor your site using third party tools like GoogleAnalytics, Google Adsense, or Google Ads. No uploaded WordPress themes or custom CSS – Themes allow you to choose the overall look of your site while CSS can be used to modify it to your exact needs. Only blogs, no eCommerce or any other types of sites – It also comes with ads and only 3GB of storage. 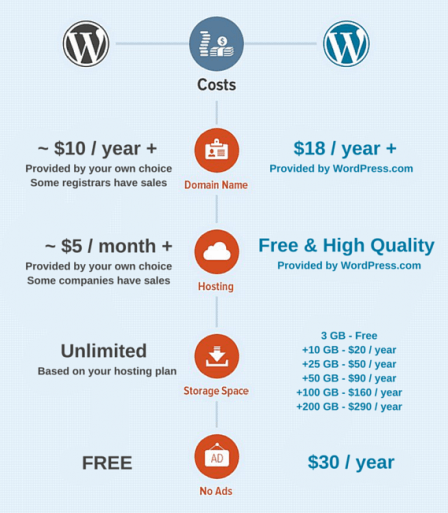 The paid plans on WordPress.com are still limited – They have “Business” and “Premium” plans, but these still fall behind many of the features and allowances you get with traditional hosting (even shared plans). Your first stop for WordPress help should be the WordPress.org websites. To make it easier for you, we have provided direct links to their tutorials and forums. We have also included additional resources outside of the WordPress.org website. WordPress Lessons – This is the WordPress.org tutorial directory page where you can find plenty of information on troubleshooting techniques, basic navigation, and web design and development. WordPress Cheat Sheet for Developers – This cheat sheet contains CSS, PHP, and HTML code for creating or altering themes and a link to a pdf download of the cheat sheet. Troubleshooting WordPress in 60 Seconds – If you are having issues with your WordPress site, chances are it’s an easy fix. This video gives some quick pointers on where to look for common problems. WordPress.org Forums – Get tips, tricks, and advice straight from the WordPress community. Learning WordPress: Most Useful Tips and Tutorials – A link to all of Smashing Magazine’s articles about WordPress, which include WordPress tricks, security improvements, as well as a plethora of other articles for beginners to advanced WordPress users.